Do you have a grand aunt? A grand ole dame of a grand aunt? to let food go to waste. – Whisk together the egg and milk until homogenous. slices on both sides in the milk-egg mixture. brown, flip to the other side, and repeat. Do the same with the rest of the bread. melts and the foam subsides, add the marmalade. up and most of the alcohol is cooked off (just 1-2 minutes). You can also opt to flambé this if you have the chutzpah. I’m still getting up the nerve. – Serve the French toast immediately, with the hot sauce poured over. like C, French toast is just not your thing. swig of Grand Marnier that douses her crepes! Cheers and happy breakfasts to you all! My husband loves french toast. And he also loves cocktails. This seems like something he will like! You're blessed indeed 🙂 what a character your grandaunt is! Happy Lunar New Year from Singapore to you and yours – may the Year of the Snake bring good health, prosperity and much happiness to you all! Hi Ling! She really is quite the character 🙂 Happy Lunar New Year to you as well! All the best!! I'll be trying this soon. Yumm. 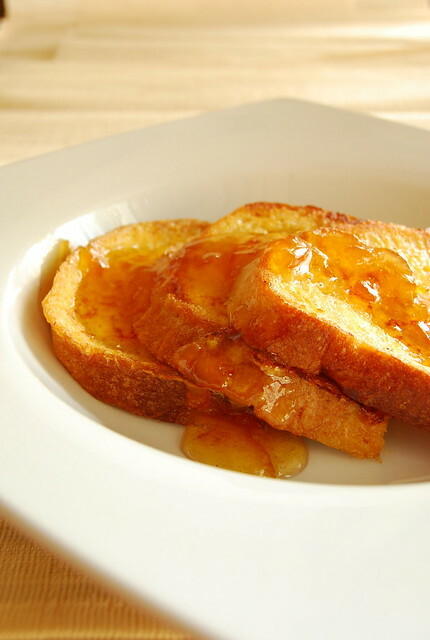 This french toast recipe looks very delicious! whoa! a nice nice twist to the usual french toast….This is adult french toast! Awesome-sounding grand aunt. Love the looks and sound of your French Toast Suzette.